Making a mess with slips! Experiments with claybodies and slip combinations. As I wait (patiently?) for my kiln to be completed, I am making pots to fill it in the first few firings. I am using a "pink" slip a lot, and also the classic white slip on a darker claybody. 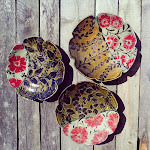 The middle photo shows a bowl with scraffito carving (leaf pattern). The bottom photo is an example of my "finger painting". All of these pots have slip on them, painted of dipped, while still in a leather hard state. None have been fired yet, which is why they are all white. This is a collection of salt-fired bottles, one of my favorite shapes to make! Made at Penland. These pots only have glaze as the black and turquoise color accents. The warm orangish color of the clay is a slip, composed mostly of "helmar". 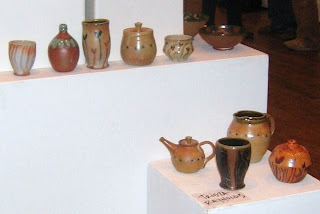 this picture is of a few of the pots i made at penland. pardon the lack of a better quality documentation. that too, is on my "to-do" list.... oh well, you get the point. people think i am crazy. i been making functional ash glazed pottery for awhile. i worked hard to develop a line of marketable pottery. and to my surprise i was selling it. a lot of it. i am blessed. so...why am i building a salt and soda kiln? my first passionate experience in firing a kiln was with a wood kiln while attending UNCG working on my BFA. i love woodfired pots. woodfired pots are so beautiful; the earth tones, the fire that is so intense and so hungry, the slips, the ashes, the flames tracing patterns around the pots. this is a process that is so complete, totally full circle. so why am i not building a wood kiln? i will explain. i am almost 32, i own an old farmhouse on 13.5 acres (all pasture! ), i grow and can most of my food, and i have 25 animals to feed, every day. i hope someday to add "mom" to that list too. oh, and did i mention i am intensely and insanely passionate about my career as a potter. but the reality is...i don't have time to dedicate to an intense multi-day firing process. (may i also add here that i will someday build a woodfired kiln. but it wont be what i base my livelihood on, necessarily). i have tons of responsibilities that simply can't be ignored for a few days. upon leaving haywood community college i had happily settled on using the ash glazes that i have become so familiar with in my work. but as time passed, secretly, i desired something more. i just couldn't figure out what that "more" really was. in 2007, i went to penland as a studio assistant to the amazing potter terry gess of bakersville, nc. the class was based on salt firing. 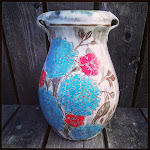 i had not really ever been a part of a salt firing, though i was familiar with the process and the effect it created. salt firing is a long standing tradition in nc pottery. 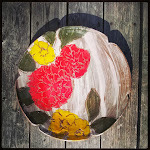 as most of you know, i am strongly influenced by the nc folk pottery tradition. why not give it a try? when i left for penland, my potter-Friends warned me "you are going to want to build a salt kiln when you get back". wonderful learning experience this will be! " haha! i had no idea what i was going to learn in those two months with mr. gess. here's what it is: SLIP. it is all about the slip. slip, in its most basic definition, is watered down clay. i love the simplicity of it. i love taking a pot in my favorite stage of clay, the "leather hard" stage and dipping it in a beautiful, fresh bucket of slimy, yummy slip! then i purposefully and atctfully, run my fingers over it. if you have never participated in this process, you will understand my excitement when i say it is just like finger painting. this stirs a child-like joy within me (this child-like joy is key to my existence i think). i love the subtle flush of the slips and the clay in the salt kiln. i love the speckled pattern where the salt finds its home on the surface of the pot. while shiny surfaces created by certain glazes in the reduction kiln have never appealed to me, the sheen of a salt fired slip is a very sophisticated thing. in adding soda to the kiln , i hope to help to satisfy my need to see the movement of the flame on the pot. i could go on and on about decoration. i am excited to start experiment with some other decorative techniques including my fascination with brushwork and maybe even some scraffito, another fascination. but for the people who think i am abandoning my ash glazes, i will say it now. i am not. i am expanding, broadening and deepening my effects. the ash glazes will appear in a different, but yet recognizable manner.